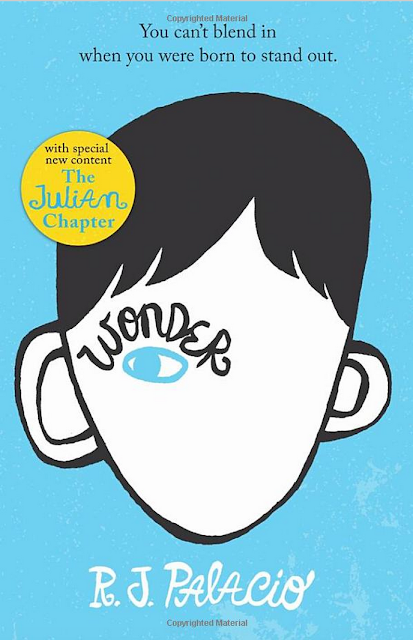 A friend recommended me this book: Wonder by R.J. Palacio and I cannot thank her enough for recommending it. It's a wonderful book and I had tears in my eyes throughout, as I read it. It is not sad kind of book. Rather it is beautifully and thoughtfully written. It is about a boy, August/ Auggie. He is extremely intelligent, sensitive, loving and warm kid. He has been born with some abnormality in his face, which makes him look ugly. His eye is in the middle of the cheek and he does not have ears. He can hear though and later in the book, needs hearing aids. Apart from that, he is a normal kid with the most loving parents, a sister and a dog. Everywhere he goes, people stare at him and are sometimes shocked to see him. He has been homeschooled by his mother till class 5. The book is about his journey in class 5 when his parents decide to send him to school. How the children treat him. Some treat him like "plague". They avoid him, do not touch him, do not sit with him, talk behind his back. Very few befriend him. How this sensitive kid deals with all this and comes out a winner in the end. The book has a strong message about being kind. In this world, we judge everyone with their outward appearances. We are fixated to being beautiful. Fat, thin, dark, fair, tall, short, all this matters to us. What really matters is a good human being, a kind heart. All through this book, my heart went out for the kid. To me, he was so beautiful. I wanted to reach out to him and hug him.